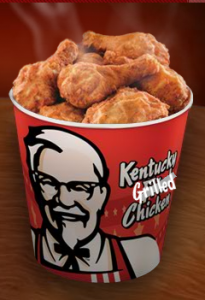 Apparently, KFC in the US is currently trialling grilled chicken in some of it's stores in an attempt to give people a "lighter" and "healthier" option. If it turns out to be a success, they're looking to roll it out across the US. Who knows, if it's that successful, maybe they'll change their name to KGC or even the full name - "Kentucky Grilled Chicken". They did change it to KFC from "Kentucky Fried Chicken" in a bid to hide the word "fried" in the past - that's what they told the world (the real reason), so I wouldn't rule the name change out just yet. One thing that intrigues me is how they're going to get the crispy texture all over when they're grilling the chicken instead of frying it. My suspicions are they'll probably load the flour used in the coating with some sort of fat that will effectively fry the chicken under the grill - pretty much like the oven baked chips you buy from the supermarket. I wonder if they'll trial this in the UK. I'd give it a go.